What’s the Project? 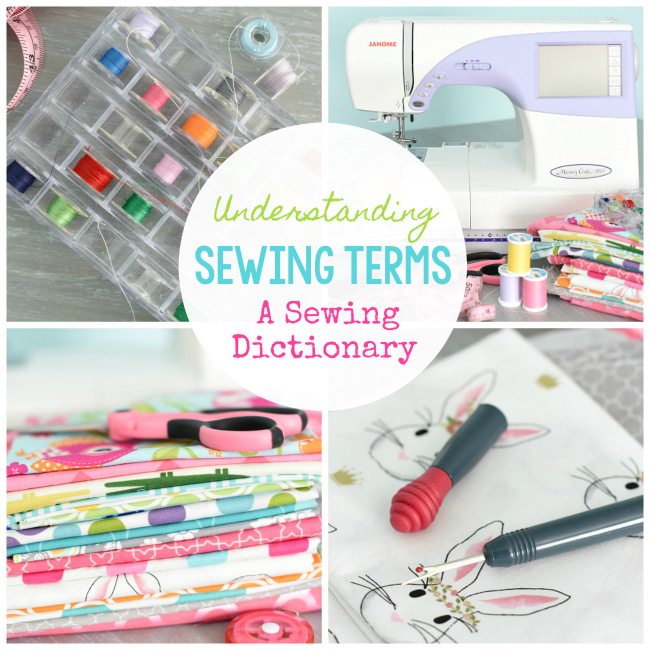 If you’re new to sewing, understanding all of those sewing terms can be tricky! 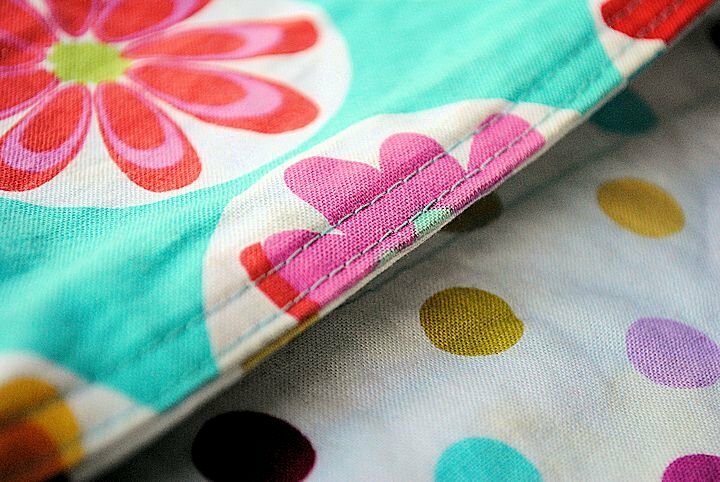 This beginner’s sewing dictionary will help define some of those words to get you going. 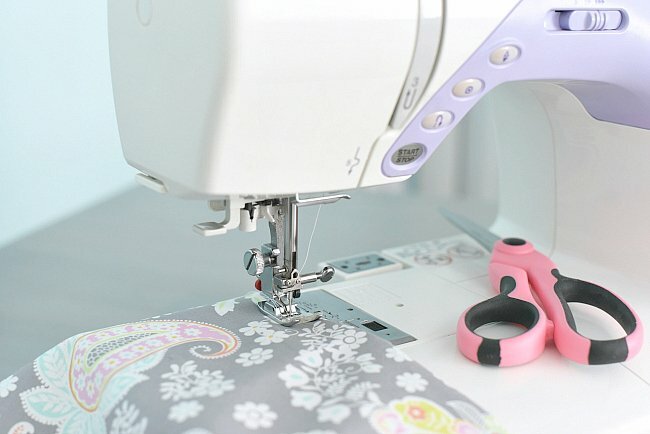 If you’re just getting started sewing, it can be really intimidating in so many ways! 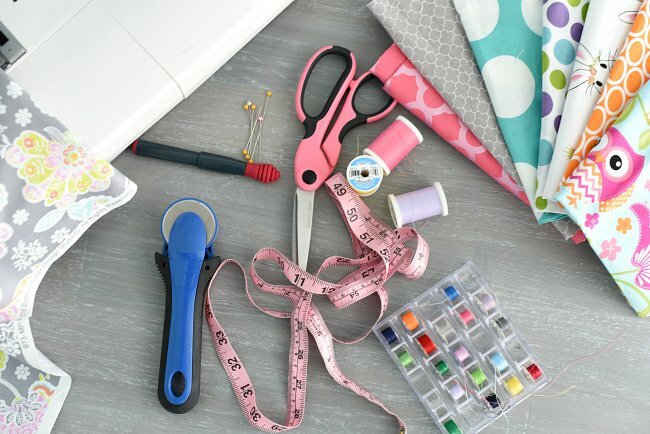 Maybe you’ve prepped yourself with all the things you think you need to begin sewing, but when you sit down to tackle that first project, the instructions are confusing and there are sewing terms thrown in there that you don’t understand! Words like bias and backstitch and applique-what do these all mean? You can’t sew this project unless you understand them, right? This beginner’s sewing dictionary is designed to walk you through some of those beginning sewing terms that might trip you up so that you can get to the fun part-creating something fantastic! I’ll break down a lot of sewing terms for you here. If you’re brand new to sewing, be sure to check out the beginner’s sewing guide as well as the Learn to Sew lessons. There’s tons of sewing information packed in there. Applique: To applique is to sew one piece of fabric on top of another, done with a satin stitch (a very tight zig-zag). 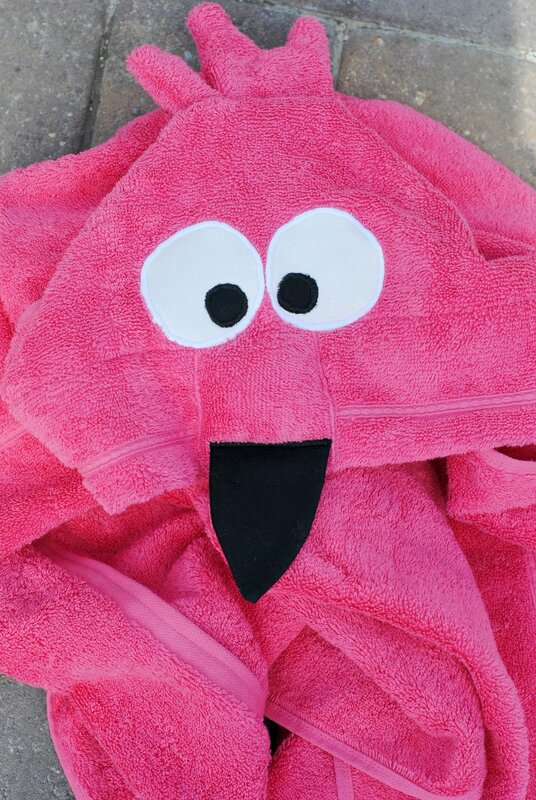 The eyes in the picture below are appliqued in place. To do this you will set your machine settings to very close together stitches on the zigzag setting. 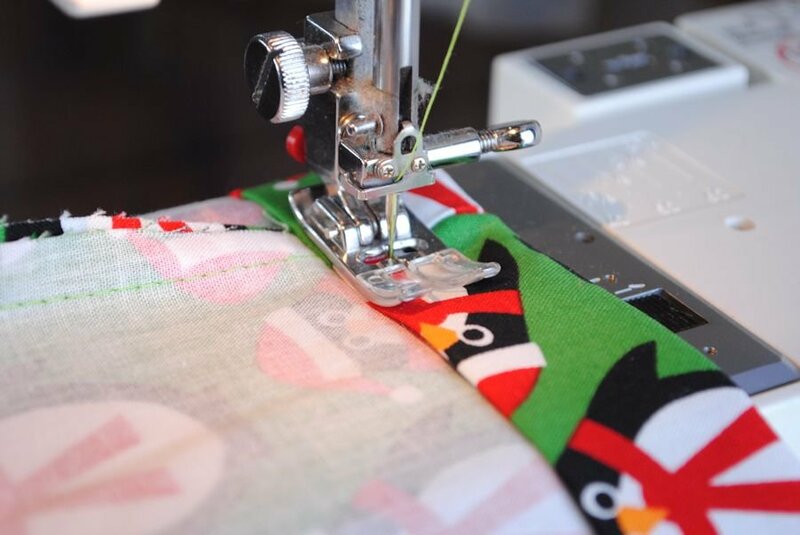 Baste: A baste is a long and loose stitch-the longest possible that your machine will do. 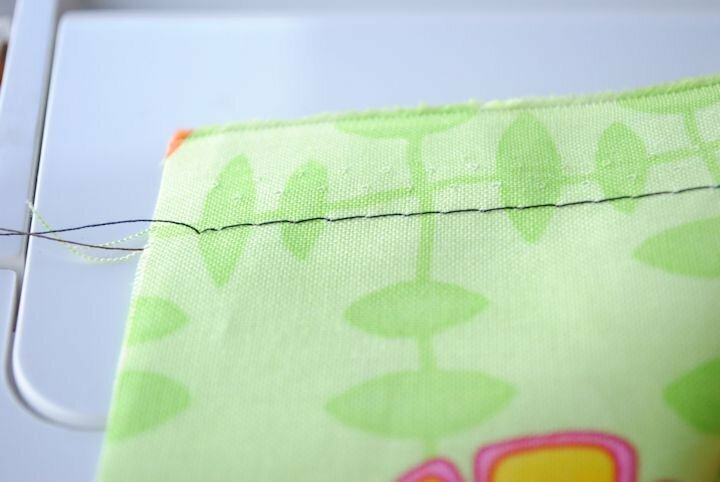 To baste you will need to set your stitch length to its longest setting (how to do that here). When you baste you won’t knot the thread at the beginning of the end. 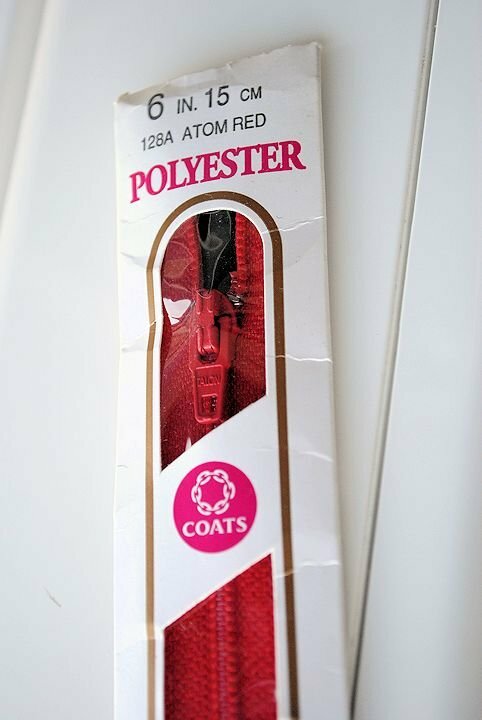 A baste is usually used just to hold the fabric in place prior to sewing or is used to gather fabric. See how the stitches in this picture are long and farther apart than a typical straight stitch and it is not knotted at the beginning? Bias: The bias of the fabric is the 45% angle from the grain of the fabric (see grain below). So basically, if you turn or cut your fabric 45% (or diagonally) from the straight up and down direction that the fabric would typically go, you are cutting on the bias. 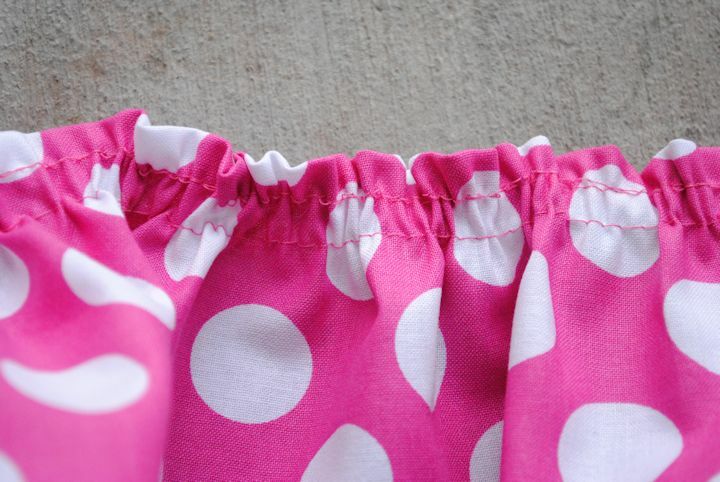 This is sometimes called for in a clothing pattern because it changes how the fabric hangs (like in a skirt or dress). 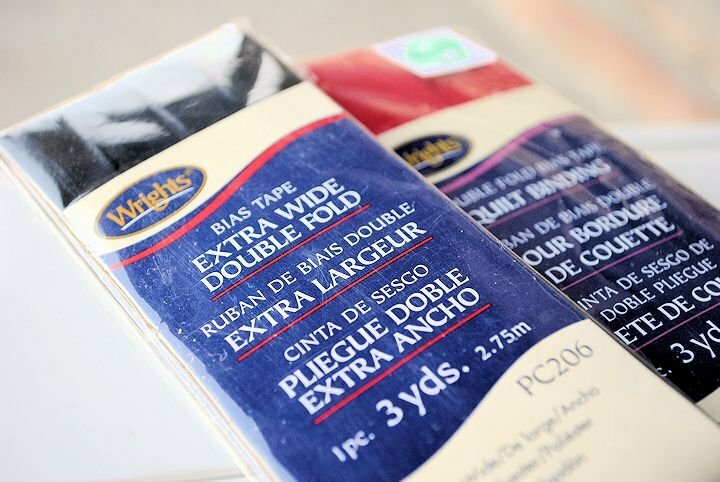 Bias Tape: Some patterns you use will call for bias tape. You can buy this at the fabric store (you can also make your own, but I always buy mine). 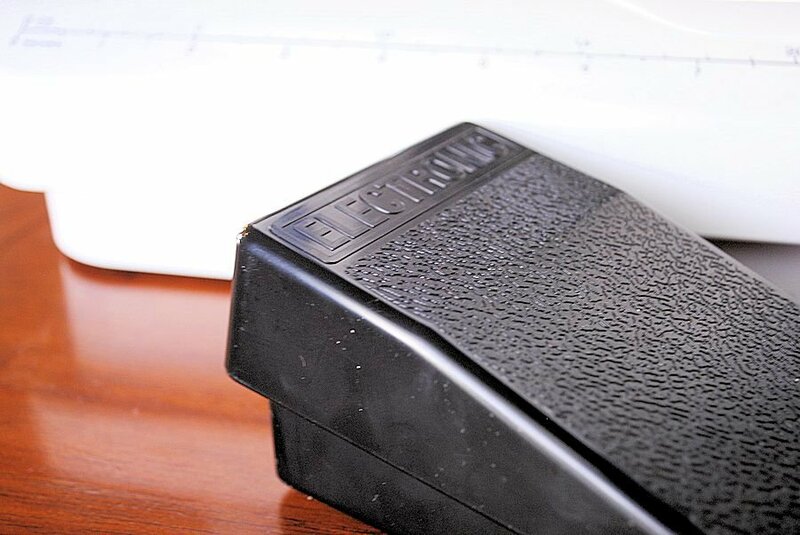 It will come in a package (see the first picture) and is typically used to edge things. It is cut on the bias which means that it bends easily around corners, making it perfect for finishing an edge on some items. Buttonhole: A buttonhole is a hole sewn to pull a button through. Many machines will sew one automatically for you. 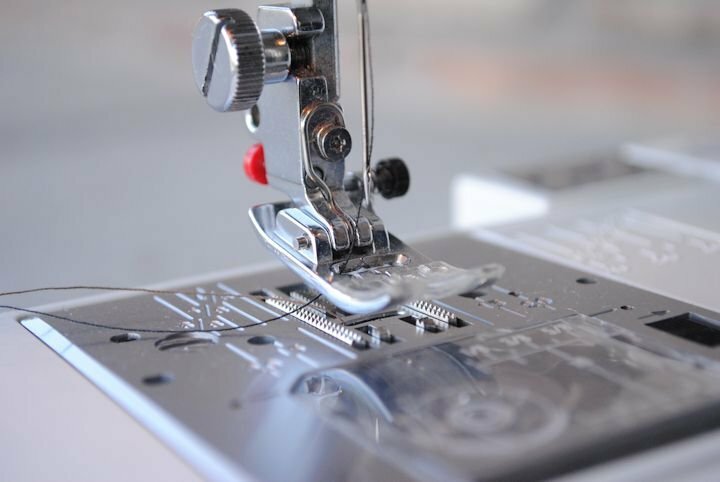 If you are doing it yourself it is done by sewing 2 parallel satin stitches the length of your button that are connected at the top and bottom and then sliced open in the middle to create a hole. Fat Quarter: A fat quarter is a particular cut of fabric. Imagine a yard of fabric laying in front of you. Then imagine that you cut it straight down the middle going lengthwise and straight down the middle going horizontally. (So basically like cutting a cross or a plus sign into it.) You will now have 4 pieces of fabric, each of which is a fat quarter. This is different than a quarter yard of fabric which would be cut just lengthwise. Fusing: You can buy fusing at your fabric store (also called Heat ‘n’ Bond). It will adhere one piece of fabric to another. To use it you will iron it onto your fabric then peel off a paper backing and iron it onto whatever you are wanting to adhere it to. Grain: Look very closely at your fabric and you will see threads that go up and down and sideways, perpendicular to each other. This is the grain of the fabric. 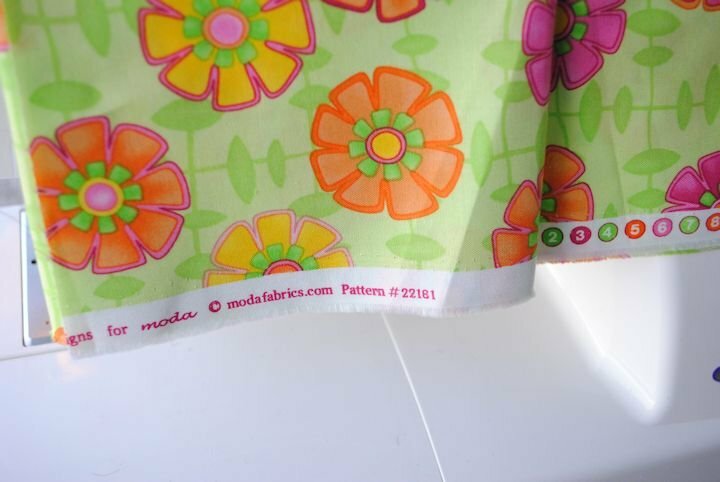 Interfacing: Interfacing can be bought at your fabric store just like fabric but in a special section. 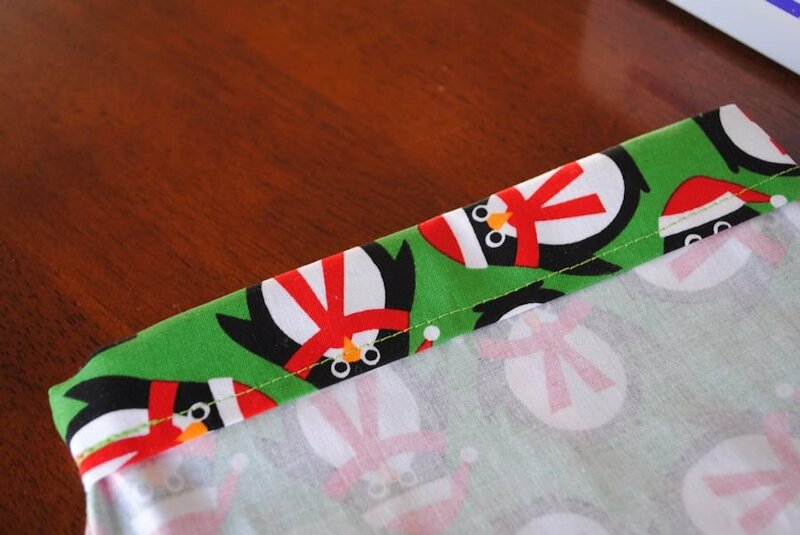 It is used to stabilize fabric or make a project a little more sturdy and is sewn on the inside of the fabric. In some patterns, you will be asked to use interfacing. 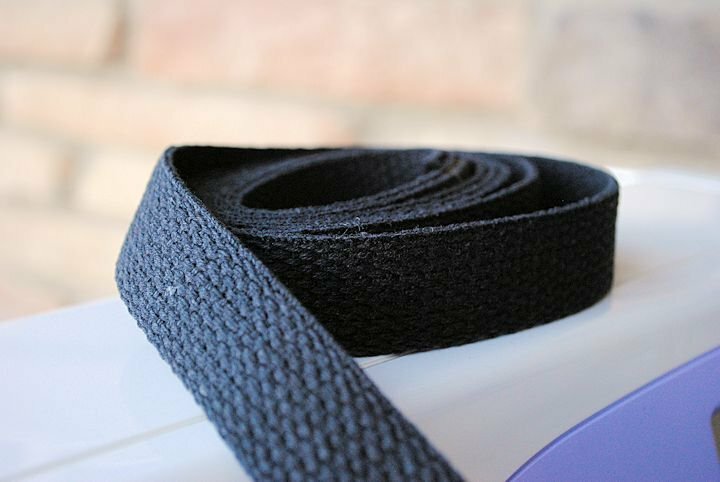 There are many different weights of interfacing, so refer to your pattern to determine what you need. If it says fusible interfacing it will need to be the type that can be ironed onto the fabric to adhere it in place. Lining: Lining is a layer of fabric that goes underneath whatever you are sewing. Think of it like this, if you lined a skirt, the skirt would have the outer fabric that is seen by all and then an under fabric that would give the skirt a little more substance and make it less see through. Some patterns will call for lining. Typically the fabric you use for lining will be a neutral solid color that blends well with your main fabric. Notions: Notions are the accessories you will need to sew a project such as a zipper or buttons, thread, possibly bias tape, etc. It could also include the tools like the seam ripper or pins. Need help deciding what to get? Here’s a rundown of beginning sewing supplies for you. Press: Iron your project to make it lay flat. Presser Foot: The presser foot is the little metal piece near your needle. 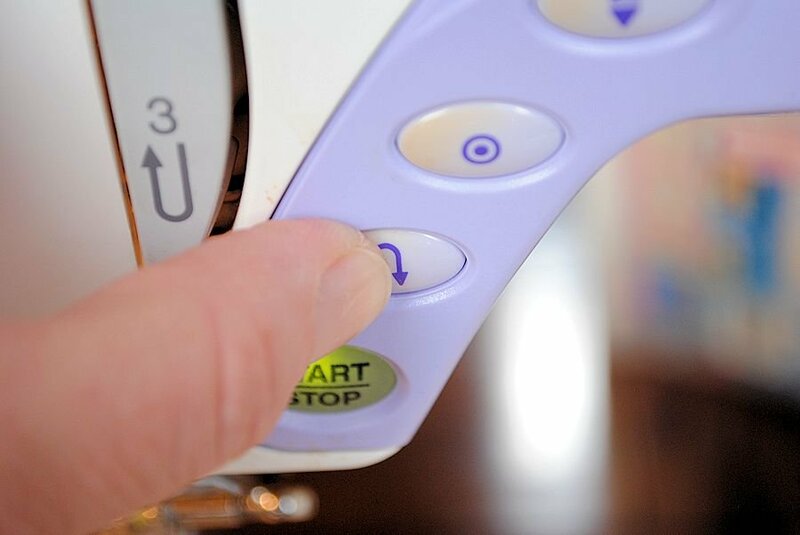 You will lower it to press down the fabric (there’s a lever just above it and to the right) while you are sewing and then lift it again when you are finished. 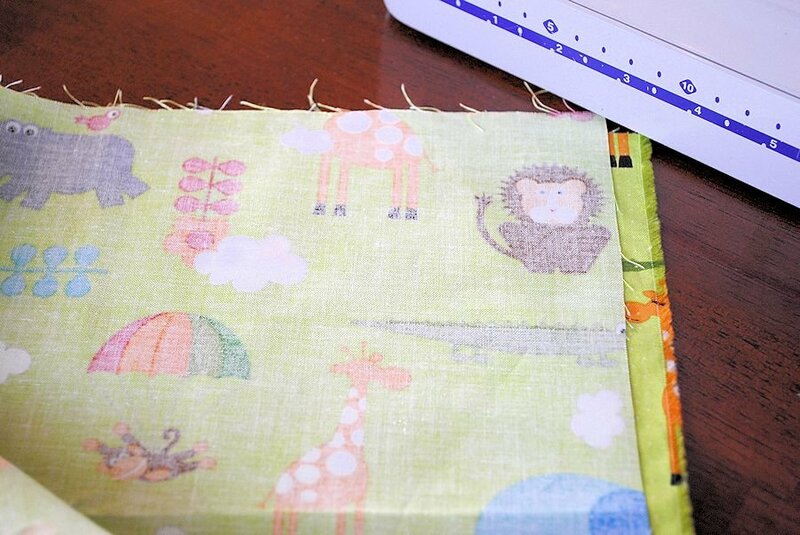 It’s function is to keep your fabric in place while you sew. 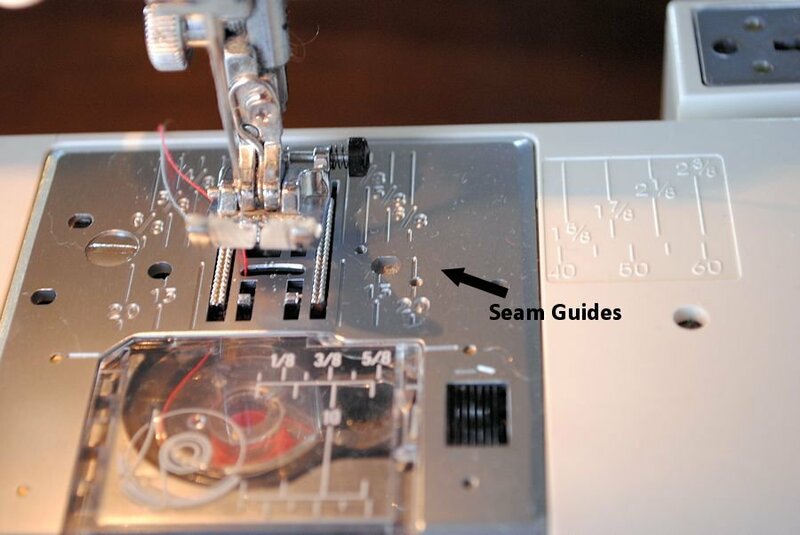 There are also other feet that you can use while sewing including a zipper foot or button hole foot, but the main foot is your presser foot. Raw Edge: The raw edge of the fabric is the edge that is cut (as opposed to selvage-see below). Right Sides Together (RST): This means that you put your 2 pieces of fabric together so that the right sides of the fabric are touching each other on the inside and the wrong sides of the fabric are showing on the outside. 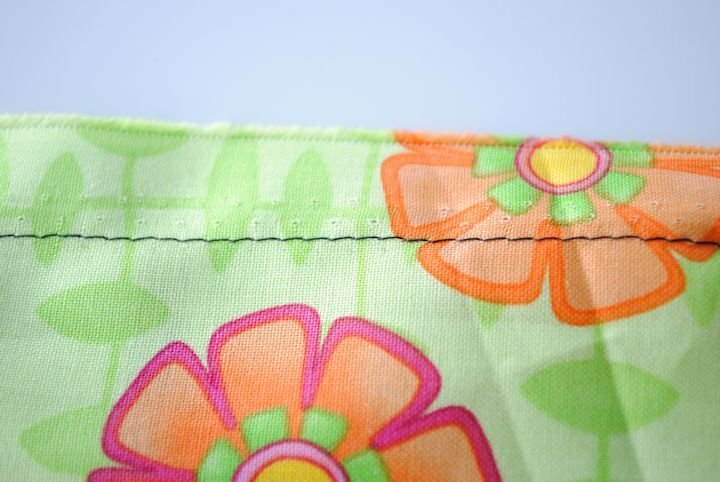 Seam Allowance: A seam allowance is the amount of fabric that is between stitch you are sewing and the very edge of your fabric. 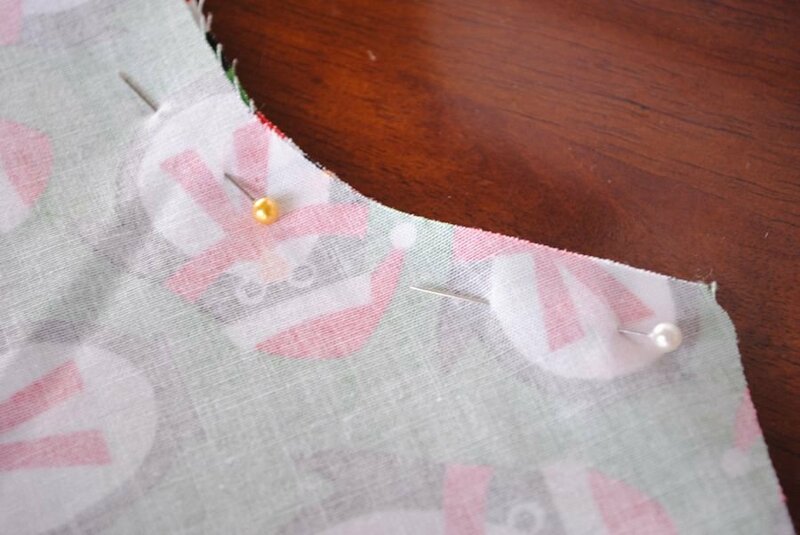 For example, if you are instructed to sew with a 1/2″ seam allowance, you would have 1/2″ between the stitch you are sewing and the edge of your fabric. 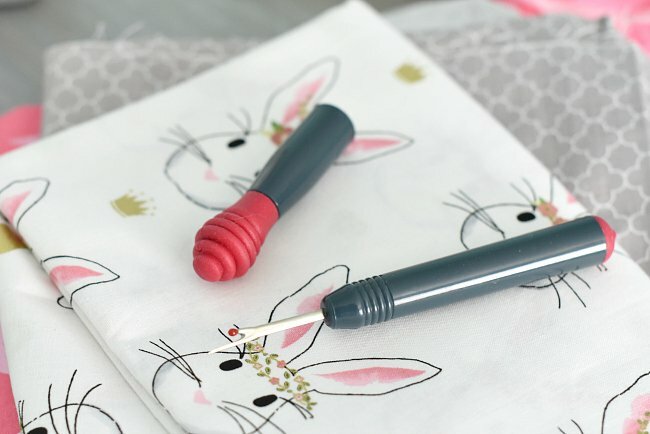 Seam Ripper: A sharp pointed tool that you use to rip out a seam when you make a mistake. 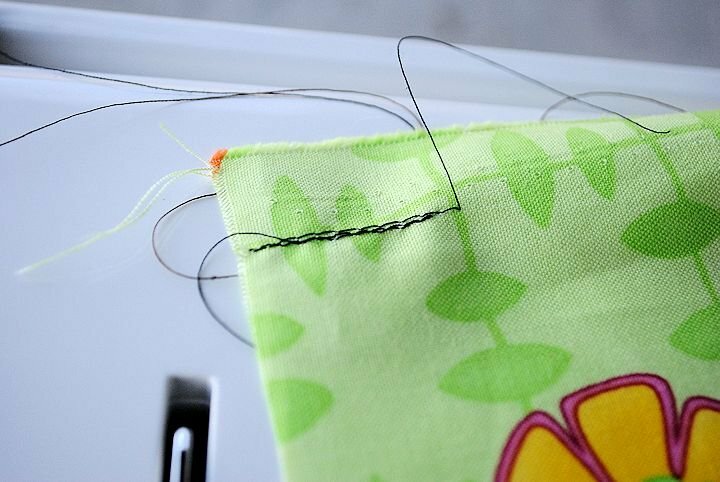 Take the sharp point and poke it underneath a stitch to break the thread. 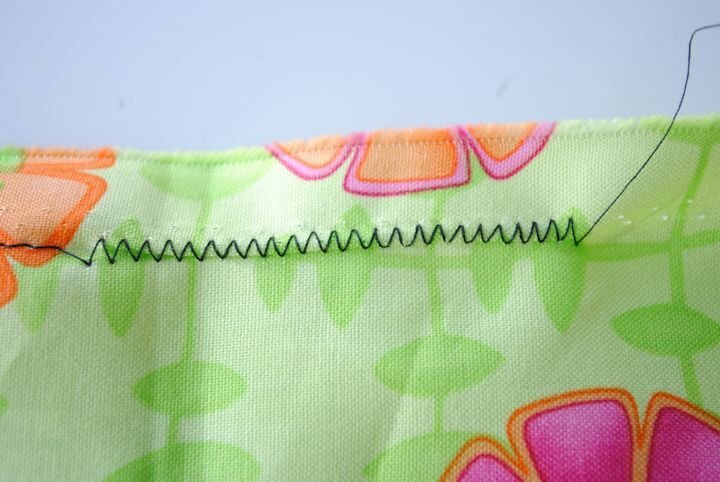 Continue to do this on any seam that you need to take out. Sewing Machine Needles: These are special needles that are inserted into your machine to do your sewing. 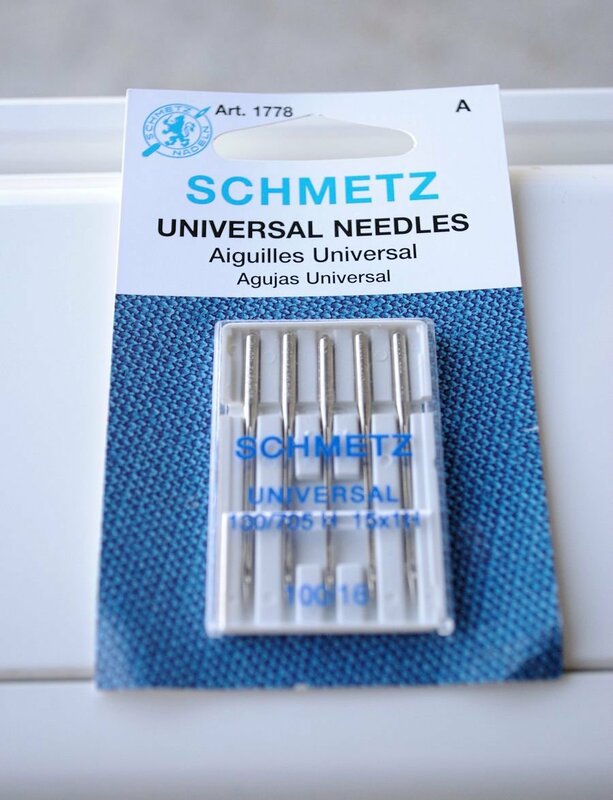 There are a few varieties, but Universal is the standard (you can also buy needles that are heavy duty, twin needles, etc.) 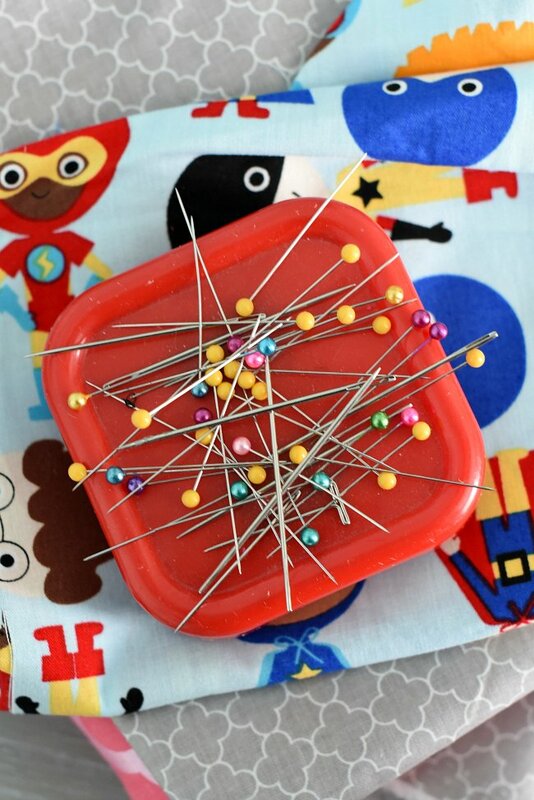 You will want to have extra sewing machine needles on hand so that if you break a needle while sewing (which will happen sometimes) you can replace the needle without a trip to the store. Sewing scissors: When you are cutting fabric you want very sharp scissors. 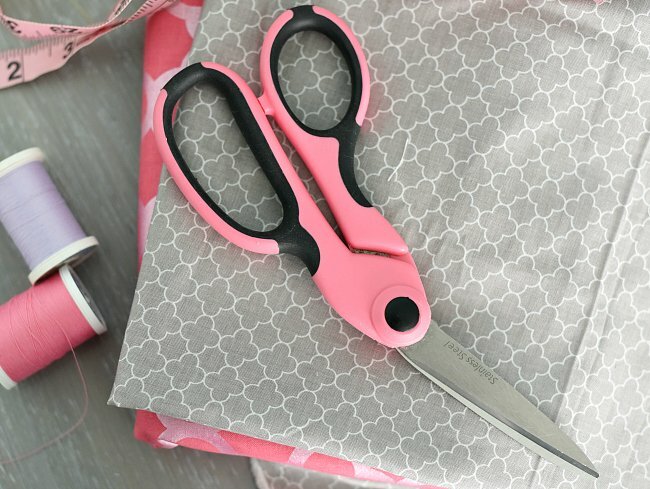 You need a pair of scissors that are used for only cutting fabric because cutting paper or other things will dull the blades. Straight Stitch: A straight stitch is a simple, straight line. 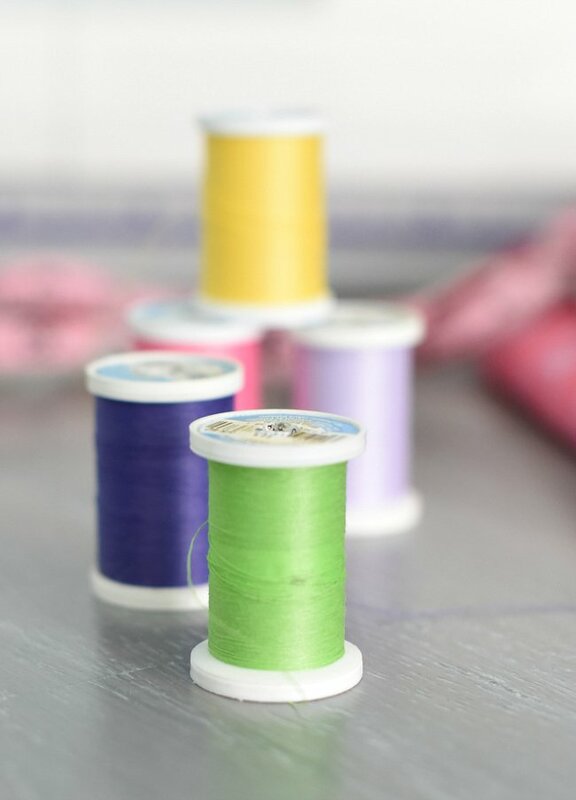 Spool of Thread: The thread that you use to create the top part of the stitch (coupled with the bobbin). You will need to thread it onto your machine (learn how here) and you will want to buy a variety of colors. 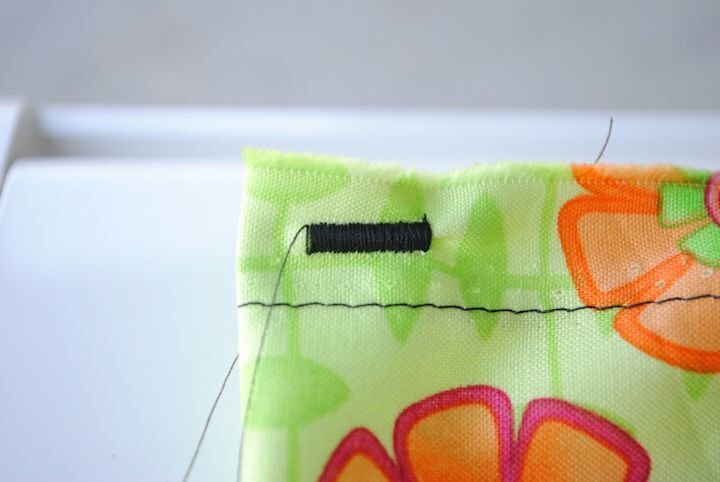 You will typically want your thread to match the fabric you are sewing on as closely as possible. 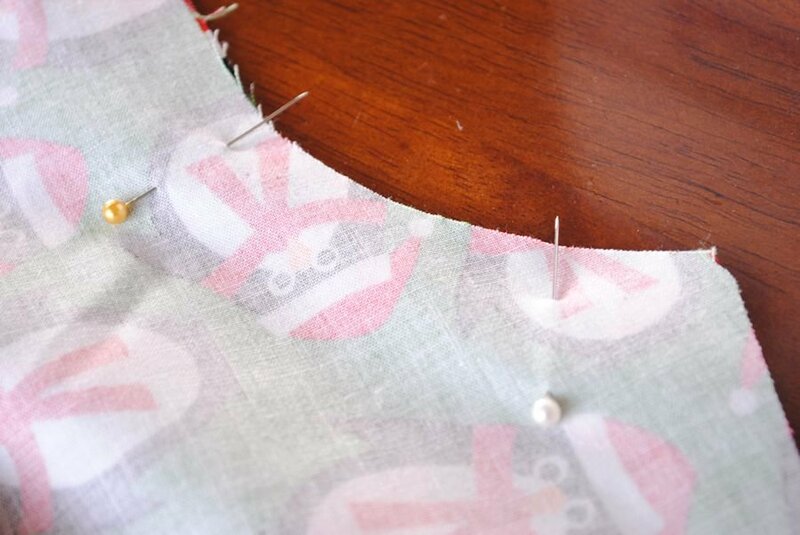 Turn: Often in a pattern, you will sew with right sides together and then be asked to turn your project. 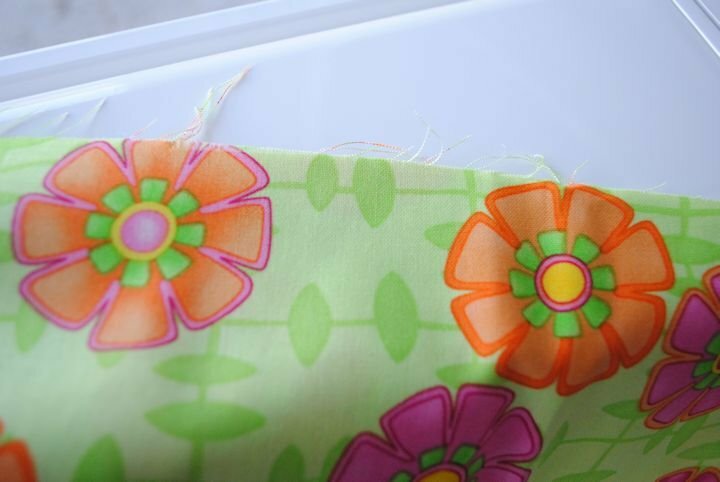 This simply means to pull the fabric through an opening so that the right sides of the fabric now face out. Hopefully having these sewing terms defined helped! Now go sew something fun! Thank you for this! Very helpful for me! I’m still a little stumped on “bias” but maybe I’ll have it figured out by the 7th. This is an awesome collection of terms. I still consider myself as a newbie sewer, so this definitely helps! Very helpful, and I’m going to tune into your Learning to Sew series on Mondays. I have also started a “Techniques” page on my blog and hope to grow and add to it as time goes by. Definitely tuning into this series since I just got a sewing machine for Christmas and embarking on a year of learning to sew. Now I don’t have to teach myself everything! Woohoo! This is great…. I am completely new to sewing, I have been reading… I love your way of explaining, it very clear. Thank you sooo much. God Bless You! So good to know. I am hoping to make it clear but haven’t been sure how I am doing. Just what I was looking for!! You have saved my sanity, THANKS!! You are AWESOME!!!! Did you create this just for me????? LOVE YOU!!!! Can you help with the tension when sewing. If it is not right how do I fix it? There are a couple of different dials on your machine that adjust tension. Can you tell me what’s going on? If I ever have a problem with tension I google it and usually find a helpful answer, but I will also say that I try not to adjust tension much on my own. I leave that to the pros (my machine is in the shop right now getting fixed because of a tension problem). Thank you very much for taking the time to put this sewing dictionary together. This is just what I was looking for. I am looking forward to your Learn to Sew series. I just found your webpage and I am already loving it! Thank you so much for such a great break down! I am learning on my own and after reading so many tuturials online and being completely lost by some of these words.. I was starting to become a bit frustrated. You’ve renewed my sewing motivation.. thank you again! I’m going to once again attempt sewing…I’ve tried quite a few times over the years but just couldn’t seem to “get it.” I love how you explain everything. I’m having trouble with my bottom stitches not looking very good, and definitely looking different than the very neat top stitches. It is a fairly new machine, less than a year and half old, a Brother, and it hasn’t been used very much. I did make a rag quilt on it, and that was it. The stitches were fine then. I know I’m threading it right, as well as winding the bobbin. I’ve played a little with the tension dial but it doesn’t seem to change. I’m really befuddled and don’t know what to do. Other than this, I love my machine (it even sews without a pedal! )but the lack of neat looking stitches is taking away the fun for me. Should I take it in and have a “professional” look at it? It shouldn’t be messing up this early in the game and after having not been used very much. Anyway, I sure hope I can learn to sew…they say you can’t teach an old dog new tricks but I’m hoping to prove this saying wrong. Thank you for all your help. If your bottom stitches are the ones messed up then it means it’s your top tension that’s off. If you have adjusted it and it isn’t helping, something may be wrong that only a pro can fix. How do I know this? My machine is in the shop right now for that exact problem. :( Google it though-there are a few helpful hints out there that might do the trick for you-like making sure there’s no lint stuck in it and things. Yes, I have adjusted it, but no change. I also took off the plate around the bobbin and cleaned the lint out-still no change. I think I’ll try changing the needle…I know a rag quilt and all that flannel can really give a needle a beating. So I’ll try this, but after that, there’s nothing left for me to try, at least that I can think of right now. And I’m pretty much all googled out. I hate having to take it in this early in the game; This really should not be happening. There’s only one place around here that fixes machines and when I took my older one there years ago just for a basic cleaning I came home and they had broken a part. Very discouraged. Oh, and am I correct in assuming that the stitches on top and bottom are supposed to look exactly the same??? This is so very helpful. I am learning to sew and I was getting so overwhelmed with not knowing the terminology. You are a LIFE SAVER!!! Very helpful!! 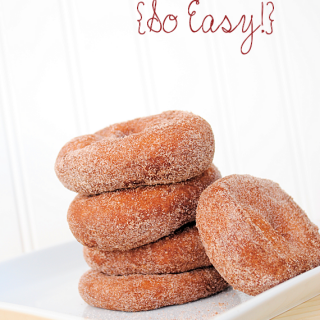 This is great for beginners! Thank you so much for the quick picture dictionary!!! It was easy and I enjoyed learning!! Thank you! great work, so useful for beginners! This is great! I am preparing to give my first ever sewing lesson for our home-school group and this will be a great visual for my first time students! Amber, I love this. Need to print this and make a book for my granddaughter. Thank You. You can do it!!! It’s fun and addicting. Thanks a lot. I’m french and this dictionnary will help me a lot when I will sew english/american pattern ! This is sooooo awesome. Thank you! Wonderful. I am a visual learner so this is a great tool for creating crazy little projects. Love it. Don’t ever stop. Thank you for helping me learn more about sewing. I love your site! Do you think you could add different hems to your dictionary? I have no idea what a blind hem is or what an overlock stitch is, but I think maybe I should know… Any help? Good ideas. I’ll try to get those added!! 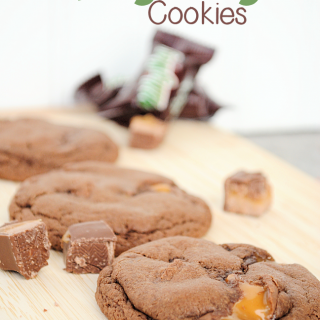 Found your link on thediydreamer.com! So glad I did, this is so helpful. Thank you for putting it together! Wow! Such clear explanations with great pictures. I am just starting out so this is a great help. Bless you! This is so very helpful, thank you so much. Thank you so very much!! I too took a sewing class in school about 40 years ago and I have been trying my best to pick it back up. I’ve been teaching myself as I go along, but, with your help it makes it easier to understand again. 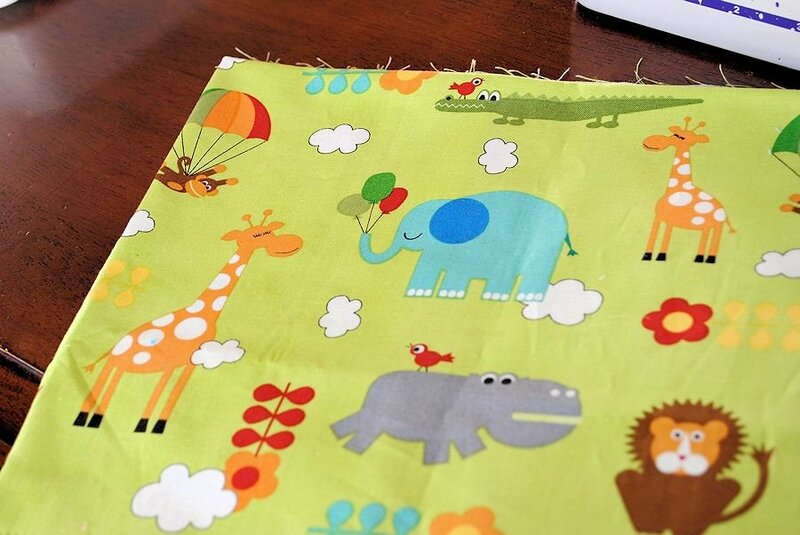 I now have several grandchildren and both of my children want me to sew for the babies. I have made tons of bibs and burp clothes and baby blankets and oh the paci clips too. But thats about to the extent of what I have been sewing and I so want to sew much more than that. Thank you again!! Finally I found easy instructions that I understand that will greatly help in my desire to learn to sew. Thank you so much sharing your talent with others, and explaining things very simple…the pictures that go along with an instruction is absolutely wonderful!! I just want to say thank you so very much! I really want to learn how to sew, but when I see what is labeled as an “easy” pattern, I can’t understand the lingo! This is great! I will be pinning you to my wall and checking back frequently!! I did not look at comments, but one many new sewers do not know is “Understitching” I have used it for years don’t know where I learned it from but I did and it is one of those sewing tricks I love and use often. Something to add to your dictionary: “yoke.” What is that? That’s one I haven’t heard in sewing! Men’s dress shirts always have a yoke at the top of the back. Many women’s shirts have yokes at the back and sometimes at the front too. A yoke is a piece of fabric the width of the back that goes from one armhole to the other. It is includes the shoulder seam of the garment. Hi! This is a wonderful dictionary, I am so happy to have found this resource. 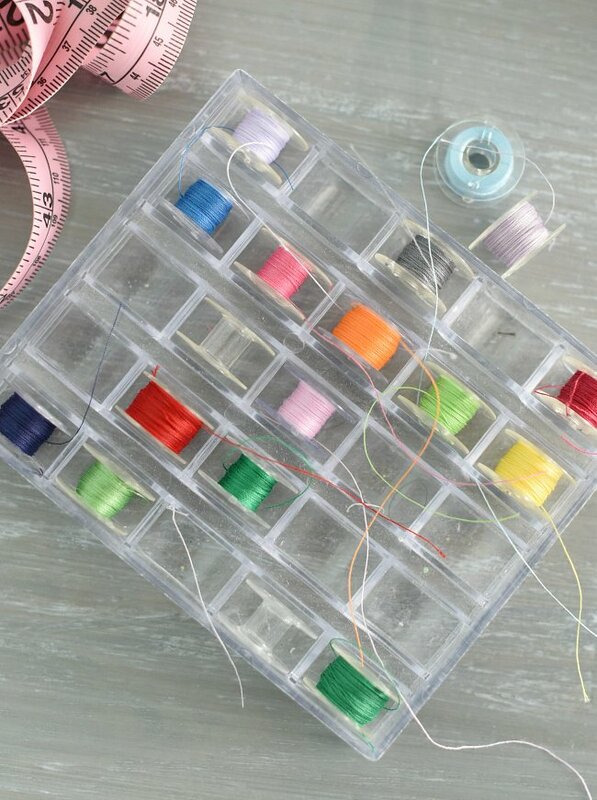 I am about as new to sewing as one can get and I wanted to read this before I set off to the craft store to buy some of my first supplies. Thanks so much, I can’t wait to explore the rest of the site. Cheers! So helpful and comprehensive – thank you!! Thank you so much! I am just starting out and your picture dictionary is so helpful!! I am new to sewing and have a question. I printed a pattern off of the internet and it has a symbol that I do not know what it means. It is a sideways T with the bottom of the T on the seam line. Can anyone please tell me what it means? I am trying to sew this dress for my wife for Valentines day. Oh now I am seeing your question. It’s probably just to help you line things up? Just wondering what happened to my comment/question about symbols on a pattern? Last I seen it was awaiting review and now it is gone. The original question was, what does the side ways T mean on a pattern? Any help would be appreciated, I am sewing a dress for my wife for Valentines day and may have a couple more questions. Was hoping from post and comments that I had seen on here that this would be a good place to get help/answers. Thanks in advance for any help. I never saw the comment. I don’t know the answer to your question but maybe a reader will. Thanks Amber, After posting my second comment, somehow my first one posted back up saying it was awaiting mediation. I am thinking that the sideways Ts are where the triangles should be for marking how the different pieces go together? Amber, thank you so much for the pictorial dictionary. It’s very useful and easy to understand especially for a newbie like me. I now have better understanding of common sewing terminology and more confident in my sewing projects. Thanks a lot for this page! I am teaching English in Spain and have just been assigned a couple of year-long classes in a fashion academy. Didn’t know the first thing about sewing terms (until now!). I am new to sewing as hobbyist. My mother was a seamstress back in our country and she is very knowledgeable but when I went out to buy my first pattern and sought out her help, the language barrier stopped us from proceeding too far into my project. The pattern was gibberish to me and I couldn’t translate half the ___ into Spanish. Through the drawings we were able to decipher some of the patter but we finally reached a wall, an obstacle that I was not going to allow me to stop my project. I am so glad that I found your blog/website. This dictionary has cleared up so much for me. I feel confident that if I continue to read through your “cracylittleprojects” I will be able to finish my project!! Oh that’s fun to hear! Thanks! Thank you so much for sharing your time and talents! This is very helpful. I plan on looking through all your sewing tips and classes! Just a word of caution: When talking about pinning the pieces together you said that in the top picture you can sew over the pins since the heads were out of the way. This isn’t a good idea because your needle can still hit the pin itself and either break or bend the needle. If that happens it can cause problems with your machine if it is computerized. Just talking from experience. This is so helpfull. Thank you for putting time into doing this. A lot of sites don’t go into detail like this. So when i read a term like ‘baste’ i thought it was a type of material. Sometimes experienced sewers assume newbies know the terms automatically. You do a very good job at explaining terms and not going too in depth. Just informational and to the point! Thanks again! Hello, I am an english student that have looked for one thing like that for ages. if you could show more about sewing I would be very kind of you. words like thimble, hem, dart. I´m not sure it is right. I’m so glad to find your page! This is very helpful for me as a beginner. Will move on to your tutorial. Thank you so much! Thank you so much for your hard work on this dictionary of sewing terms. My Mother (RIP) & Aunt Ruth (RIP) tried teaching me to sew during the winters we were snowed in & school was called off. I must admit I didn’t appreciate the time & effort they spent on me way back then. Now I can only wish I had that time back with them as we all sorely do in hindsight looking back on our teenage years at all of our “bumpy road” choices. I’m retired now, and am surprised at how much I actually DID pay attention back then, lol, but I still found some gold nuggets of info in your dictionary. I’m sure they’re looking down on me and shaking their heads with satisfaction knowing “I would need to know how to do this someday!”. At any rate, to show my appreciation when I turn out a garment or quilt or craft, I always put TYM&UR as my credits. (Thank you Mom & Aunt Ruth ;) ) Again, thank you very much for the dictionary information!! Many blessings to you & go with God my friend! My mom tried to teach me when I was young too and I didn’t pay much attention. I sort of just taught myself during college. Love that you are embracing it now! I found this dictionary VERY helpful. Thank you for creating it. I just have one question. What is facing? ‘Facing’ is the name of a small pattern piece that is cut to match the curve of the neckline, armhole, etc. It is then sewn onto the neckline or armhole and turned to the inside of the garment. Sometimes ‘interfacing is added to the wrong side of the facing to give it more stability. 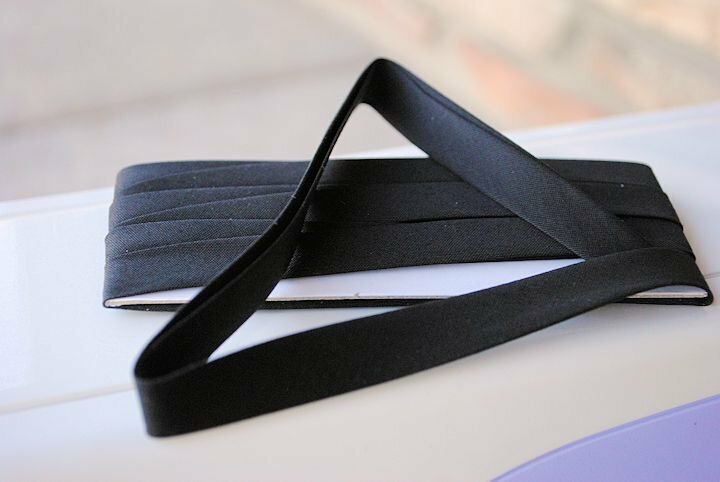 It can also be the part that is folded back at the front of a blouse or jacket to support buttons and buttonholes. Can you tell me what pulling taut is? I read it once on a different website. This is a great set of terms for sewing beginners! I just bought my first sewing machine and have neen so overwhelmed by everything there is to learn about sewing. This is by far the best blog I have found online. It explains things from a beginners perspective and is so easy to understand. Thank you for doing this! Oh I’m so happy to hear that! Good luck in your learning! Thank you so much for enlightening a sewing dummy! I usually hand sew, but I also do some machine sewing. For now I only sew simple things like clothes for my many different dolls (Barbie, Dawn, Takara Jenny, etc.) and am trying to learn a little more difficult stuff. Hi! My machine keeps breaking down and I need to bye a new one. Can you tell me what kind of machine you have? Or what kind of machine works good but is still easy enough for a beginner? Thank you so much.